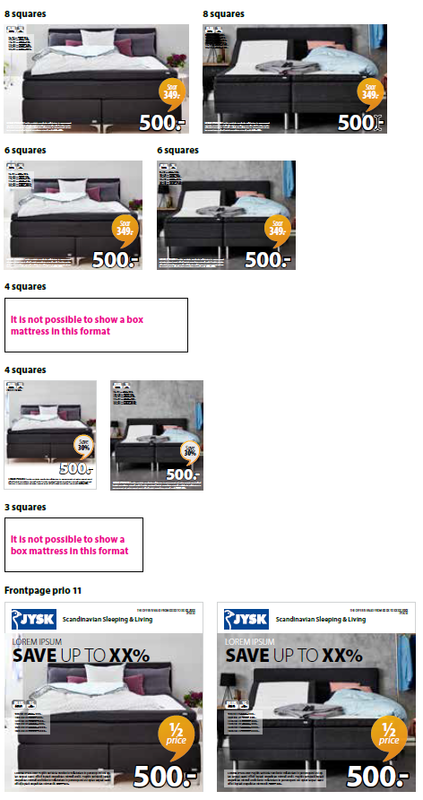 To get the best possible product focus, we need to crop and zoom in on the environmental photos of mattresses, duvets and pillows more than previously. The photos often consist of more than one product, but only one of them have a price. The focus needs to be on the product with the price, and instead crop the other products. See the examples on following pages. 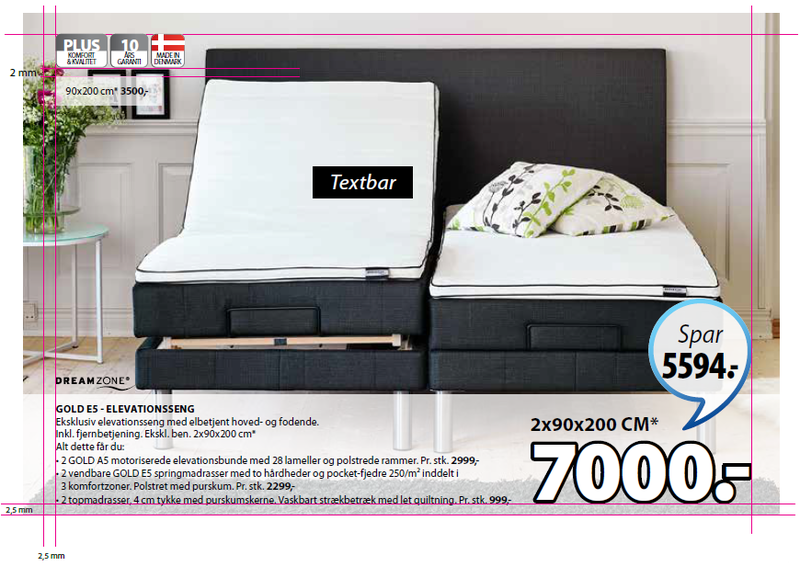 B in name like PLUS B20 – means that offer is for the box mattress and we need to show the whole mattress, legs as well, no zoom/close crop needed. C in name like PLUS C20 – means that offer is for the continental mattress and we need to show the whole mattress, legs as well, no zoom/close crop needed. 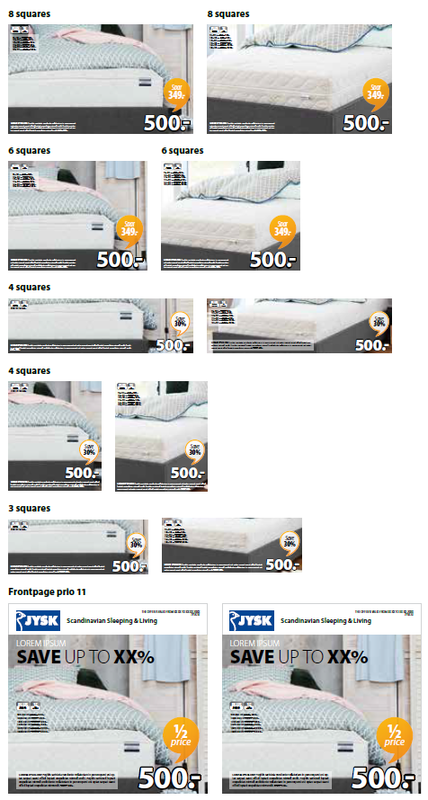 E in name like PLUS E20 – means that offer is for the elevation mattress and we need to show the whole mattress, legs as well, no zoom/close crop needed. 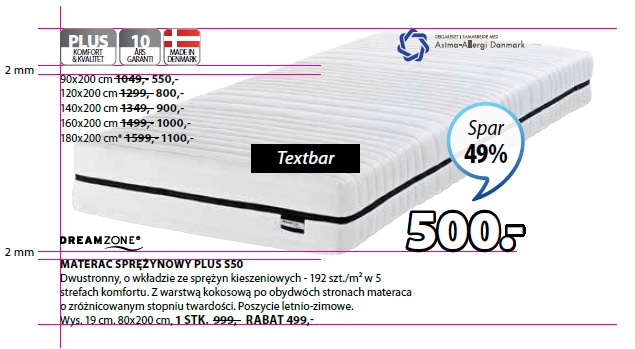 S in name like PLUS S20 – means that the offers is for spring mattress and we need to zoom in on spring mattress. 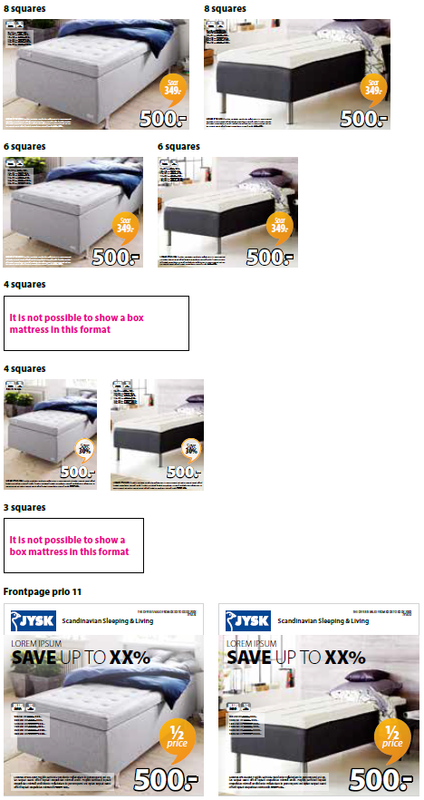 F in name like PLUS F20 – means that the offers is for foam mattress and we need to zoom in on foam mattress. 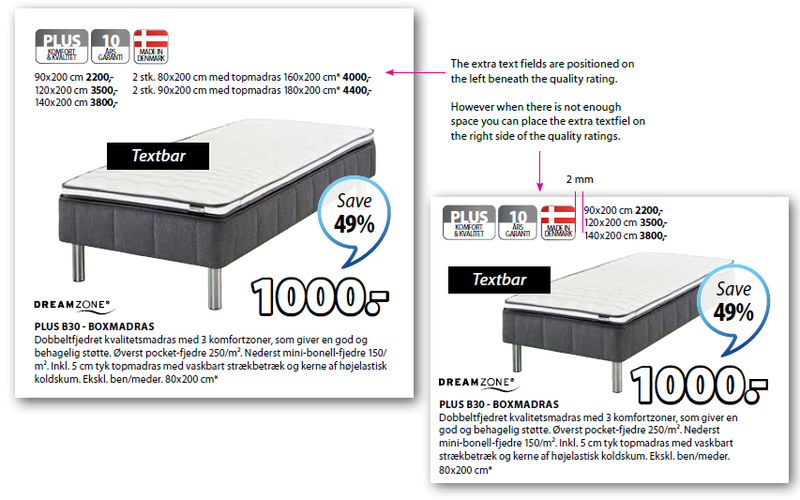 T in name like PLUS T20 – means that the offers is for top mattress and we need to zoom in on top mattress. We need to zoom in on spring and foam mattresses. We need to show the whole mattress, legs as well, no zoom/close crop needed. We need to zoom in on top mattress. We need to zoom in on pillows and duvets. 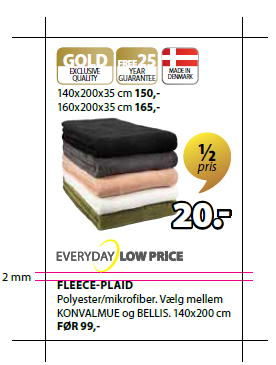 Quality labels are available in three different qualities BASIC, PLUS and GOLD. They must always be placed in 100%. Font size is 5 with a leading of 4.4 in all other countries apart from Bulgaria. Here is font size is 4.8, but with the same leading, i.e 4.4 pt. 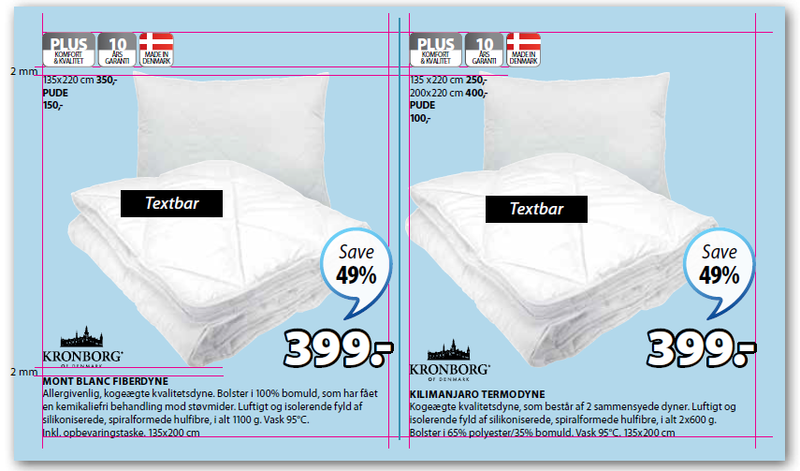 The examples are intended to serve as guidelines, although there will always be products and layouts which require modifications from what is shown here. The most important focus are the products. 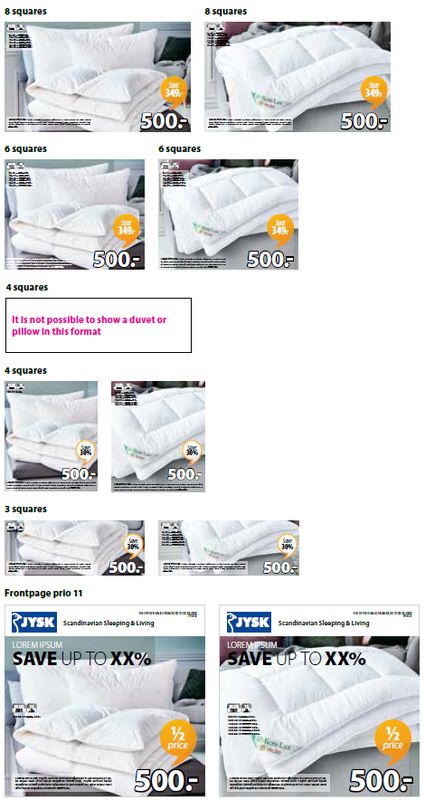 If you have cut out images of duvet and pillow as seperate files you have to place them like shown below. The pillow in the background slightly centered behind the duvet. The extra text fields are positioned on the left beneath the quality rating. The word PILLOW will always be in all caps and bold. 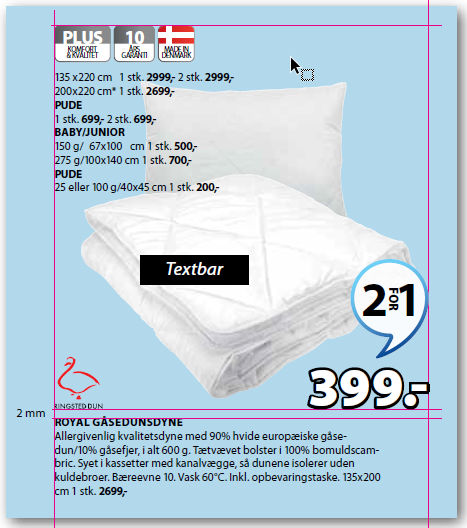 Note: Only exception is JDK - JDK pillow text is not bold - only with caps. The examples are intended to serve as guidelines, although there will always be products and layouts which require modifications from what is shown here. The quality rating and the made in logo should be placed at the top. The EDLP logo is placed like a normal logo with 2 mm distance to the top of the pomotion text.